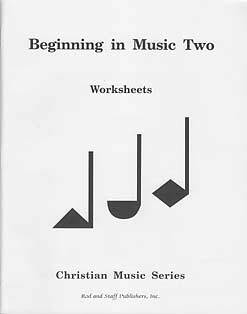 Beginning in Music Two has 36 one-sided, tear-out worksheets that review and drill syllable shapes and kinds of tones. This course is more advanced than the Grade 1 course in that pupils learn to draw shaped notes and characters showing note values, and they are drilled in writing the names and values of the notes. Rests are included in Grade 2. Pupils learn to draw and label rests. Worksheets 10, 19, 30, and 34 are tests.